Strange Companions is a debut novel about a mind in the grips of dementia. Simultaneously a fast-paced mystery and a moving meditation on memory and identity and told through Maud's unforgettable voice, it humanises a condition most of us find impenetrable and frustrating." 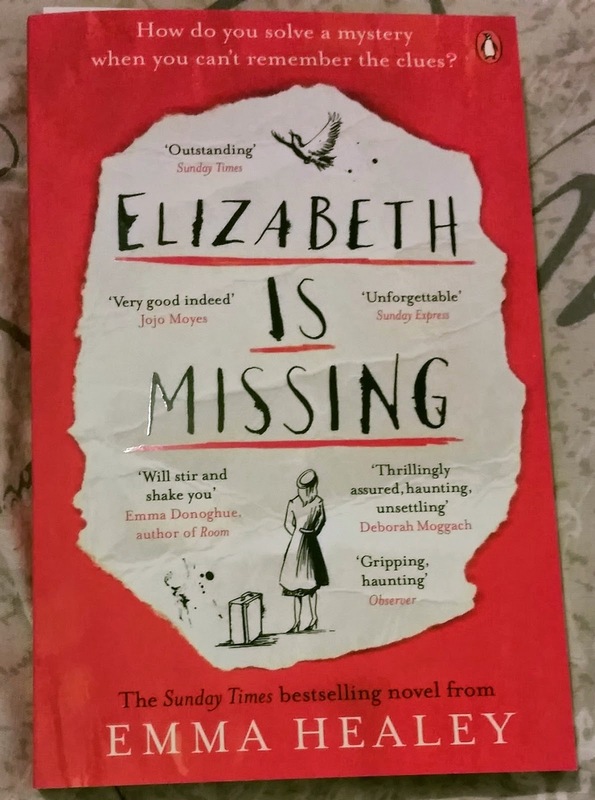 ‘Elizabeth is Missing’ by Emma Healey is an emotional rollercoaster of a novel about an elderly woman living with dementia. Eighty-two year old Maud is an endearing old lady suffering from dementia. She can’t even remember things that happened a few hours ago and is constantly writing notes to herself, although half the time she doesn't know what they mean. When we first meet Maud she is still living in her own home. She has a carer come and visit her once a day and her daughter Helen visits every afternoon. But one thing Maud does remember is that she can't get hold of her friend Elizabeth. At first Helen dismisses it saying that maybe Maud spoke to her and forgot about it, but Maud is completely convinced that Elizabeth is missing and no-one is doing anything about it. Maud isn't living solely in the present. She keeps thinking back to 1946 when her sister Sukey went missing, and seems to be confusing the two events by sometimes thinking she is seeing people from her past (Frank and Douglas) in the present day. Maud is a really sweet character and the book is told entirely from her perspective, so as readers we are only getting the bits of information that she is remembering. The fact that no-one else believes that Elizabeth is missing makes the reader think that Maud has been told what is going on but doesn't remember it, so we are trying to piece it all together as much as Maud is. I really enjoyed the flashbacks to Maud’s past and I think it was great that the narrative of this book was split over the two time-zones. It was almost like two novels in one (although they were connected) with the mystery aspect of the flashbacks, and the emotional contemporary feel to the modern day part. I think I went through almost every emotion while reading this novel. I really felt like I connected with all the characters and I completely fell in love with Maud. By the time I’d finished reading this I’d been through every emotion under the sun. The ending was just perfect and conclusive but still left me wanting more, like all good books do. Let me know what you think of this book, or if you’re excited to read it in the comments below! In this pulse-pounding sequel to Kass Morgan's The 100, secrets are revealed, beliefs are challenged, and relationships are tested. And the hundred will struggle to survive the only way they can -- together." As you may already know, I'm obsessed with ‘The 100’ at the moment. I recently read the second book in the series, ‘Day 21’ by Kass Morgan. At the very end of book one, the hundred on the ground realise that they are not alone when an arrow flies through the camp, striking Asher in the neck and killing him. Clarke had also had suspicions a bit earlier on when she came across an apple orchard that was way too neat to have grown naturally. ‘Day 21’ opens with the funeral of Asher. The remainder of the hundred (minus Bellamy, Clarke and Octavia) are gathered around the grave saying their goodbyes. Meanwhile, Bellamy and Clarke are out searching for Octavia who has gone missing. Whilst following the trail, Clarke comes across some pieces of a dropship that looks like it has come from the Colony, but not the ship they came down in. This leads to more questions about if the Colony has sent people down before, and if so why wasn't anyone told? Throughout this book Clarke tries to piece together what has happened in the past and why the other dropship was there. Like ‘The 100’ this book is also told from the perspectives of Clarke, Bellamy, Wells and Glass. I think the quad-perspective thing worked really well in the first book so I'm glad Kass stuck to it in this one. A few new characters are introduced in this book, the main one being Sasha who is one of the Earthborn. Sasha is captured by the colonists as they believe she is one of the ones behind the attack and they hold her prisoner. She is a feisty teenager but doesn't seem violent and is adamant that she and her people are innocent. A lot is happening back on the Colony too, which we see through Glass’s eyes. The Chancellor is still in his coma from the previous novel, so Vice Chancellor Rhodes is in charge. Glass does a lot of sneaking from Phoenix to Walden which leaves he in a predicament more than once. We find out a lot more from the flashbacks inserted in to the chapters about a girl named Lilly who (as we know from the first book) was one of the kids being experimented on by Clarke’s parents. Clarke became good friends with her, and eventually Lilly convinced Clarke to end her suffering. In this book we find out that Bellamy also had a connection with Lilly and this creates a divide between Bellamy and Clarke. I love how the flashbacks are placed throughout the book as it really helps to build a bigger picture of the story and gives an interesting insight into the pasts of these characters. There is a lot more action in this book, which made it faster paced and easier to read. I think I actually read this in two sittings as I couldn't put it down. Some questions from the previous book get answered but more and more are asked throughout so this book leaves the reader with more questions than they had when they started. This isn't a bad thing though, as it made me want to know more and eager for the next book in the series. Overall, I thought this was a great second instalment to the series and I'm really looking forward to book 3 ‘Homecoming’ which comes out at the end of February. Let me know what you thought of this book in the comments below! I recently got my first ever Funko Pop Vinyl figure in my December Loot Crate. It was 'The Joker Batman-Batman' (Super Heroes Collection #65, Loot Crate Exclusive) and at was pretty darn awesome! I've been thinking about starting to collect these for a while and when I got my Joker I knew I wanted more of these little fellows in my life. That's when I discovered this great website called 'Pop in a Box'. It's a great place to just buy Pops as they always have lots of great ones in stock, but they also do a subscription service where you are sent a Mystery Pop every month. The great thing about this is that you will never get a Pop you already have, and are guaranteed to get one that you like. After you have created an account on their website you can go through the entire catalogue of every Pop ever made and select either 'Thumbs Up', 'Thumbs Down' or 'I Have This Pop'. If you select thumbs down or you have it they will NEVER send you that Pop. You will always be sent one on your thumbs up list (if they have one in stock, if not you won't be charged for that month). For a single Pop it costs £8.49 plus £3.50 p&p per month, for 2 Pops it's £16.88 plus £3.50 p&p per month, for 3 Pops it's £25.17 plus £3.50 p&p per month and for 6 Pops it's 49.44 plus £3.50 p&p per month. I opted for 1 Pop and received my first parcel yesterday. I came securely packaged in a sturdy box that was exactly the right size, so the Pop wasn't rattling around inside. First thing I noticed when I opened the box was a free packet of popping candy. Yum! 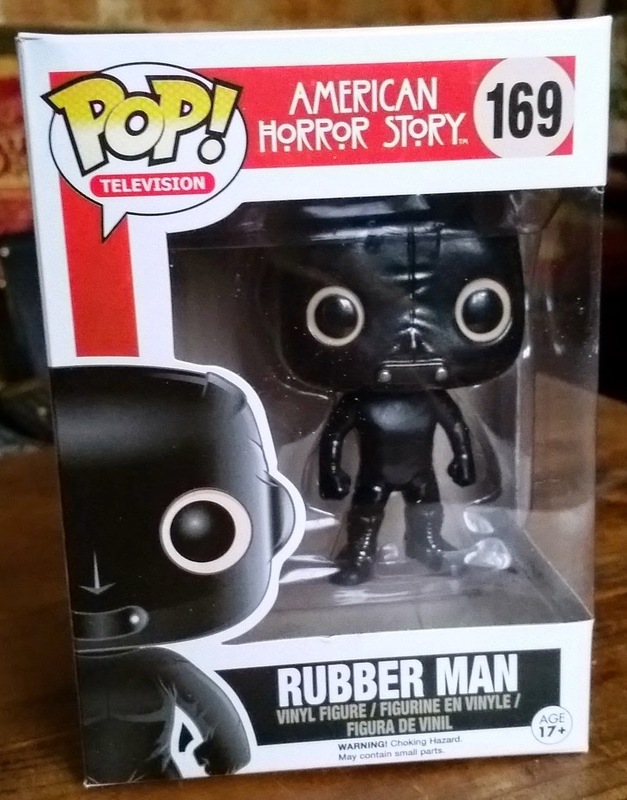 The Pop I received this month was the 'Rubber Man' from American Horror Story. I'm so super happy with it! 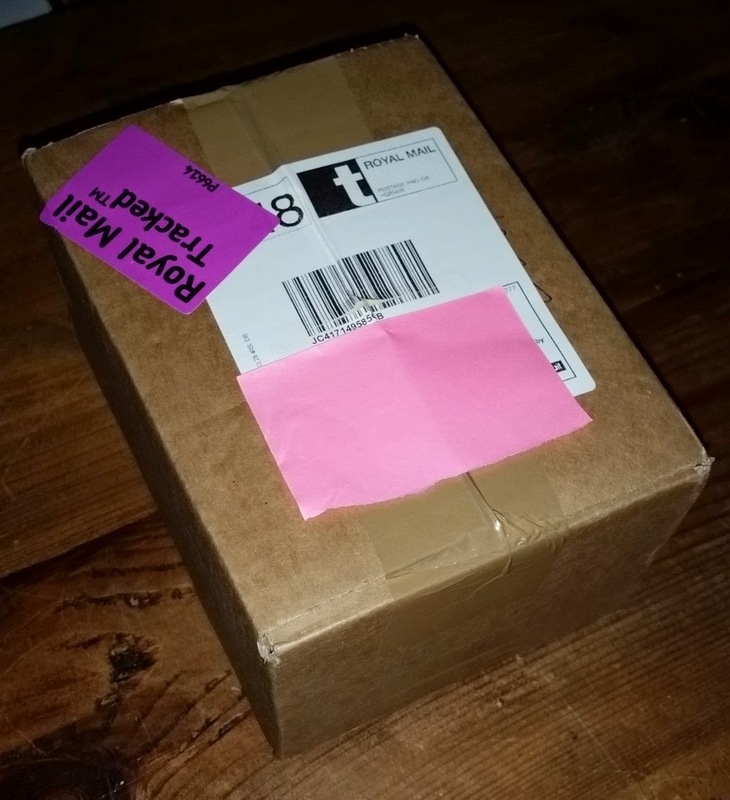 It was so well packaged that the box is in perfect condition. Not a dent on it! I honestly think this is a really great service and can't recommend it enough. I think it's so much fun to get a little surprise every month that you know you're going to love. 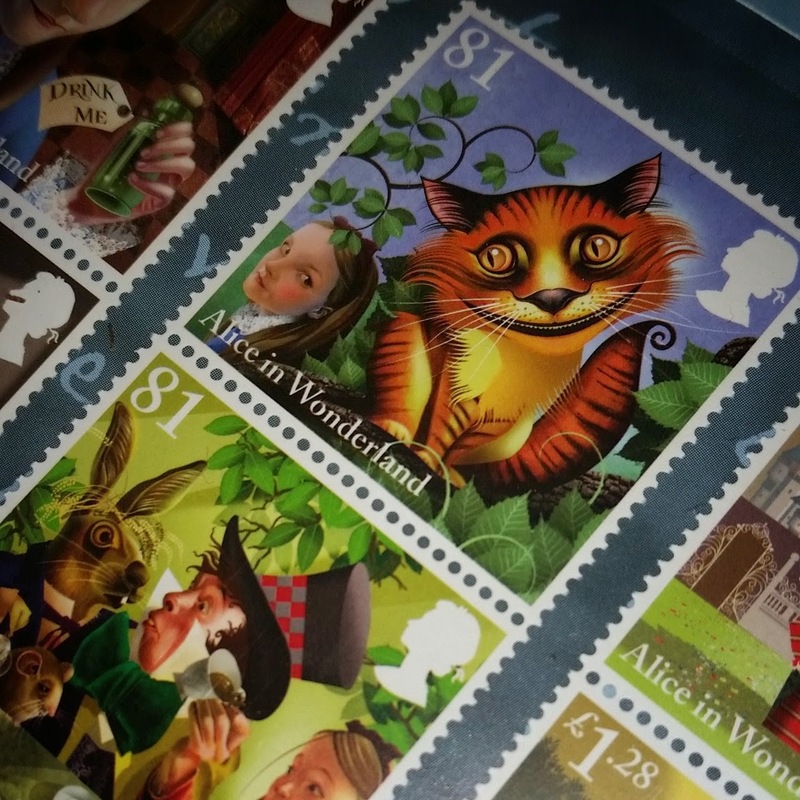 So who’s seen Royal Mails new ‘Alice in Wonderland’ postage stamps? They’re absolutely gorgeous! I rushed down to my local post office to grab a pack but unfortunately they were all sold out so I had to buy online. 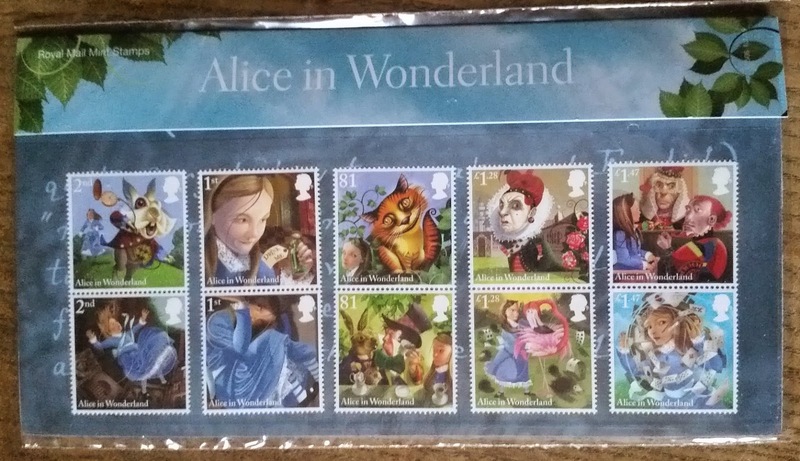 I opted for the ‘Presentation Pack’ which was a little bit pricier than the standard set, but it came with all 10 stamps and a fold-out card with a biography of Lewis Carroll and the story of how ‘Alice in Wonderland’ came to be. The stamps come in this beautiful pack. The stamps are loose and can be removed (I had to open mine and straighten them up as they moved around a bit in the post). They are covered by a clear plastic film for protection. I think my favourites are the Cheshire Cat and the Mad Tea Party ones, although the artwork on all of them is gorgeous. I would love to see an illustrated edition of the novel with this artwork! So what do you all think of the stamps? What are your favourites? Let me know your thoughts in the comments below. I think they're so much prettier in person and I'm so glad I bought the set. "No one has set foot on Earth in centuries - until now. I'm the sort of person who has to read a book before watching a film or television adaptation. 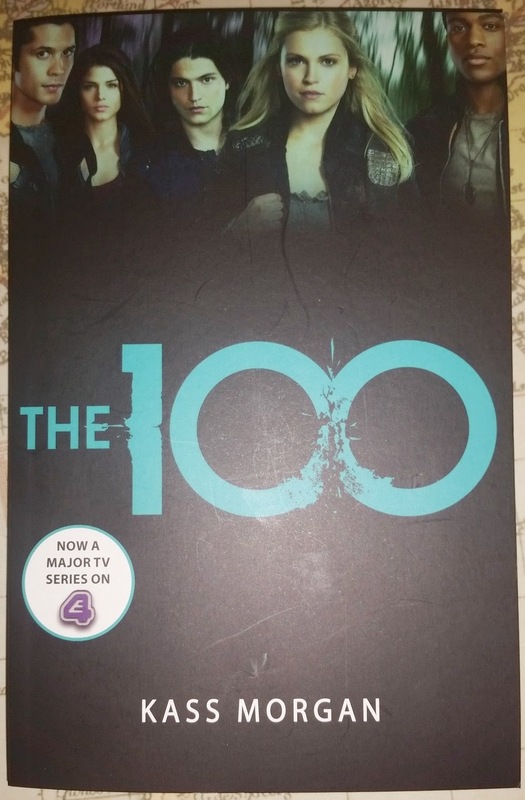 However, in the case of ‘The 100’ I had no idea that the book existed, so you can’t blame me for watching the show first right? ‘The 100’ is now into its second season (E4, Tuesdays at 9pm in the UK!) 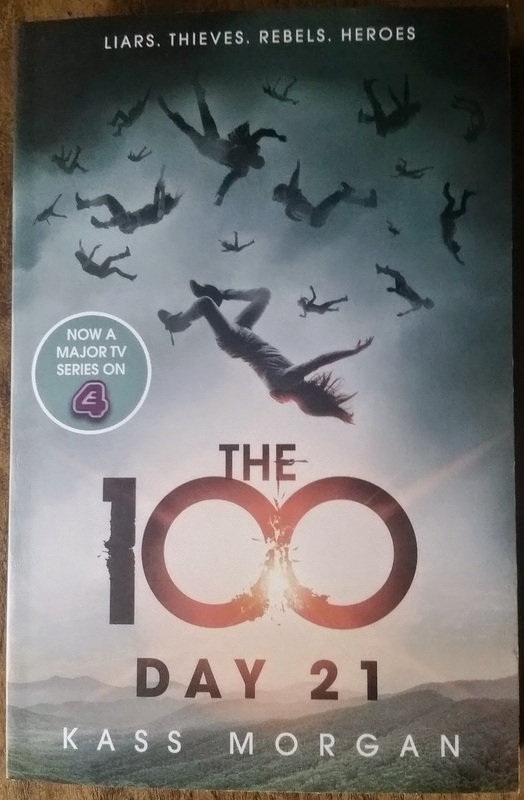 and I've finally bought and read the first two books in the series; ‘The 100’ and ‘Day 21’ by Kass Morgan. I'm not going to do a huge comparison of the books and the television adaptation on this post mainly because they are so very different from each other that it would make it too long. I may do a separate comparison post later on. This is just going to be a review of the first book in this series. In ‘The 100’ we are presented with a dystopian future where the Earth has been made unlivable by nuclear weapons in a World War Three scenario. What’s left of the human race is living on a space ship called The Colony orbiting the planet. The Colony is made up of three sections, Phoenix, Walden and Arcadia, and the humans have been surviving on this ship for just over 300 years when we come into the story. Throughout the book, with the aid of real-time narrative and flashbacks, we find out that life on the ship is tough. Rationing is a bit part of their lives as things we take for granted like food, water, power and even oxygen is scarce. This ship is also falling into dis-repair as it was never intended to take this long to get back to the ground. Rules are very strict and the population growth is severely monitored. Crime is punishable by death for adults but under 18’s get a second chance. They are put into Confinement until their eighteenth birthday when they are submitted to a re-trial where they are either pardoned or given a lethal injection. The book is split between the four perspectives of Clarke, Bellamy, Wells and Glass. When we first meet Clarke she is one of the kids in Confinement. She has lost all sense of time while she has been locked up, so when the guard opens her door and tells her the doctor is on his way Clarke assumes that she has turned 18 and is going to be killed. However, much to her surprise Clarke finds out that she is one of 100 prisoners being sent down to the ground on a desperate mission to find out if the radiation has subsided and Earth is survivable for humans again. Next we meet Wells who is the son of the Chancellor. He is also the former boyfriend of Clarke. We find out that Wells has broken the law so that he could be one of the 100 going down to the ground in a crazy attempt to keep Clarke safe. Glass. Glass is already on the dropship, resigned to the fact that she is being sent on a mission that could end her life when she sees an opportunity to escape the ship and run back into the Colony. She is pursued by guards until she finally take shelter in an air vent which turns out to lead to Walden. Perfect for Glass as she knows for somewhere in Walden that she will be safe, the arms of her boyfriend Luke. However things do not go well as she discovers that Luke has started seeing someone else in her absence. Deterred, Glass returns to her mother on Phoenix where she later gets pardoned for her crimes. The dropship reaches the ground safely and there is no immediate threat from radiation. The novel tells the story of how these kids learn to survive on the ground, building their own civilisation and making their own rules. People are wary of Wells at first as he is the Chancellors son and they think he has been sent to spy on them, however once they learn that he had been Confined like the rest of them a lot of the kids turn to him as their leader (with the exception of a few like Graham who have been Confined for more serious crimes and don’t want to answer to anyone). Clarke is the only one with some medical training as she was a trainee doctor before she was Confined, so she spends the first few hours trying to treat those who were injured when the dropship came down but she soon realises that all their medical supplies are missing (presumably lost among the debris from the ship). The other kids busy themselves but putting up tents and gathering scattered supplies. They discover that they have only been given a few weeks’ worth of rations and Bellamy decides that he will need to go out and hunt at some point. I quite like how, as a reader, we get to view the story through the eyes of these four very interesting individuals. While they had all (apart from Bellamy) been Confined, their back stories are very different, so they all have very different perspectives on life. However I'm not sure it needed three perspectives from the ground and it made the story feel a little jumpy when transitioning from chapter to chapter. I love how the flashbacks were inserted into some of the chapters. It was great to see little snippets of these characters backgrounds and it really helped me as a reader to build up a good picture of the characters’ lives. Clarke is a very strong female lead and through her flashbacks we find out about how she came to be so tough at such a young age. She is a natural leader and I think the fact that she is the only one with medical training means that the others trusted her easily once they were alone on the ground. Bellamy is also a very strong character, but it is clear from the outset that he is only interested in protecting himself and Octavia. I think the bond between them, as the only siblings left in the world, comes across really well in the writing. I adore the concept of this novel and the writing is brilliant. I thought it maybe could have done with a bit more action, but overall a great first book in what I'm sure is going to be an amazing series. "The star of the hit show Glee shares her experiences and insider tips on beauty, fashion, inner strength, and more in an illustrated book that’s part memoir, part how-to, and part style guide. Lea Michele is one of the hardest working performers in show business. Whether she’s starring as Rachel Berry on Glee, rocking a glamorous look on the red carpet, recording her solo album, or acting as the spokesperson for L’Oreal, Lea is the ultimate multi-tasker. 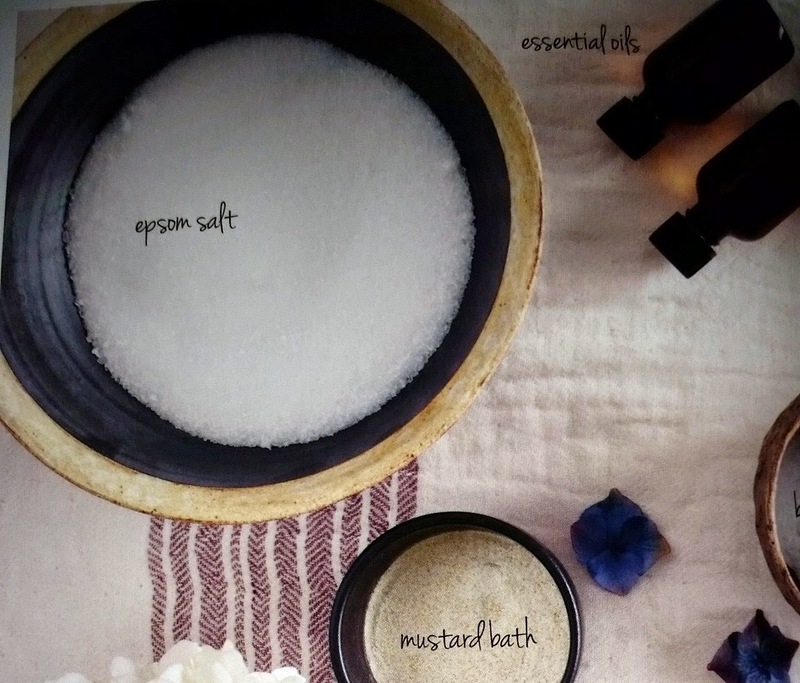 She knows better than anyone that it is difficult to be your best self and keep things in perspective when your to-do list is overflowing and you are faced with challenges, so she’s developed a foolproof system for remaining healthy and centered. In Brunette Ambition, she reveals the lessons and advice that have worked for her--from beauty and fashion secrets to fitness tips, and career insights. 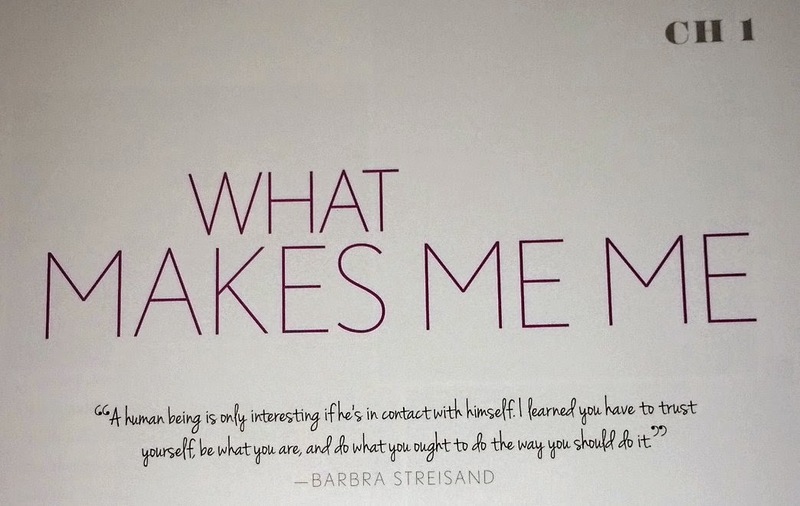 Supplemented with never-before-seen photos and revealing anecdotes, it’s the book Lea wishes she’d had in her teens and early twenties: A practical and inspirational guide to harnessing tenacity and passion and living the fullest life, no matter what obstacles life puts in your way." I've been a fan of Lea Michele since the beginning of Glee in 2009. She's such a fun and inspiring role model with a killer voice! Since watching her in Glee I went on to look into her Broadway career and came across Spring Awakening which is now one of my favourite musicals and soundtracks of all time. Needless to say, when I found out that Lea was writing a book I was excited. I was expecting a standard autobiography, but Lea has outdone herself by creating a book that is not only about her, but about passing on all her tips and tricks for a healthy and fit lifestyle, along with beauty and fashion advice. In the first couple of chapters Lea talks a bit about her family, and growing up in New York City. She broke into the Broadway business at a very young age. Lea doesn't go into much detail about how she got onto Broadway. Her Broadway début was in 1995 playing alternating roles of Young Cosette and Young Eponine in Les Miserables at the very young age of just 8 years old. Lea goes on to write a few pages about what she learned from each of her experiences on Broadway and how they helped develop her career and skills as an actress/singer. What I love about Lea’s style of writing is that she expresses her experiences in a way that the skills learnt can be applied to everyday life, so are relatable to almost any job. I was a little disappointed that Lea only wrote a couple of pages on her experiences in Spring Awakening, as it was such a large part of her life. From initial workshops to the end of her Broadway run, Lea was with the show for 8 years. I would have liked her to have included a bit more about how the workshop process worked before the show ended up on Broadway. Lea ends this section of the book with some frequently asked fan questions which I think is a really great way to impart some advice that the people reading the book want to hear. Lea does another section like this near the end of the book too. I think the next section of the book is possibly my favourite. Lea talks all about healthy eating and includes a lot of her favourite recipes for breakfast, lunch and dinner. One of my resolutions for this year is to start eating more healthily so I've found this section very useful. 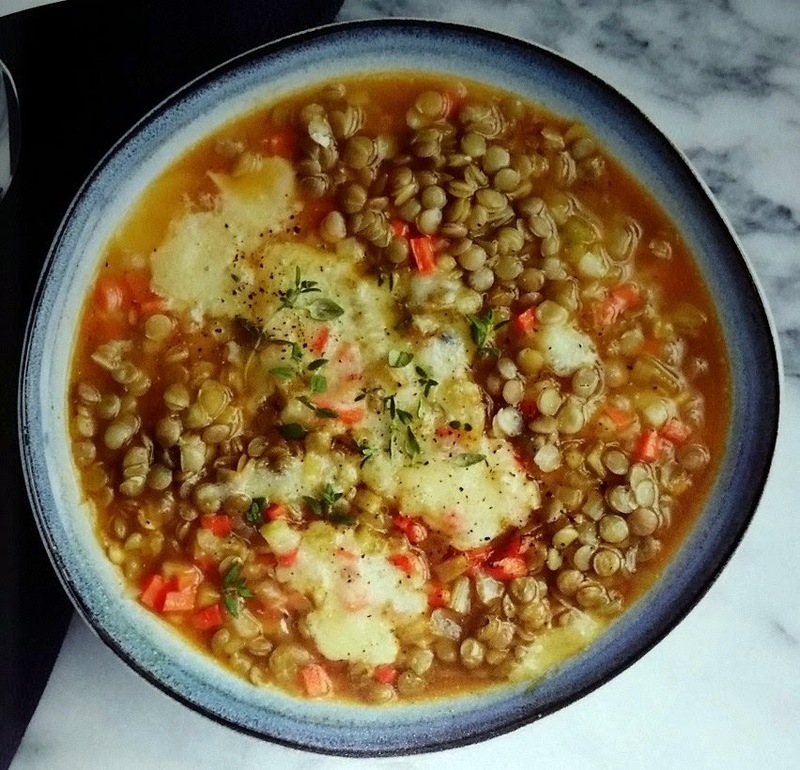 I've tried Lea’s recipe for French-Style Lentil Soup (pictured on the left) and it really is a delicious meal and something that I wouldn't normally think to make. I'm definitely going to be trying out more of Lea’s recipes! She’s also added some great recipes for juices for energy, a meal supplement and de-bloating. ‘Living the Fit Life’ comes next. The thing I love about this section is that Lea lays out a step-by-step routine for keeping fit that you can do in your own back yard or living room. The instructions include very useful photos to show exactly what you should be doing. The next few sections are fashion and beauty tips. This isn't something that would normally interest me so much but the way the images and text are laid out makes it easy and fun to read and I actually found it very enjoyable. I even picked up some tips on hairstyles and applying make-up. In the last section Lea talks about the importance of friendship and staying grounded. She also talks about her experiences with Glee and the transition from Broadway into television. This book is a great insight into the life of a young star and I also think a really useful source for tips on being healthy and staying fit. I can see myself coming back to this book many times in the future to look up a recipe or a skincare trick. 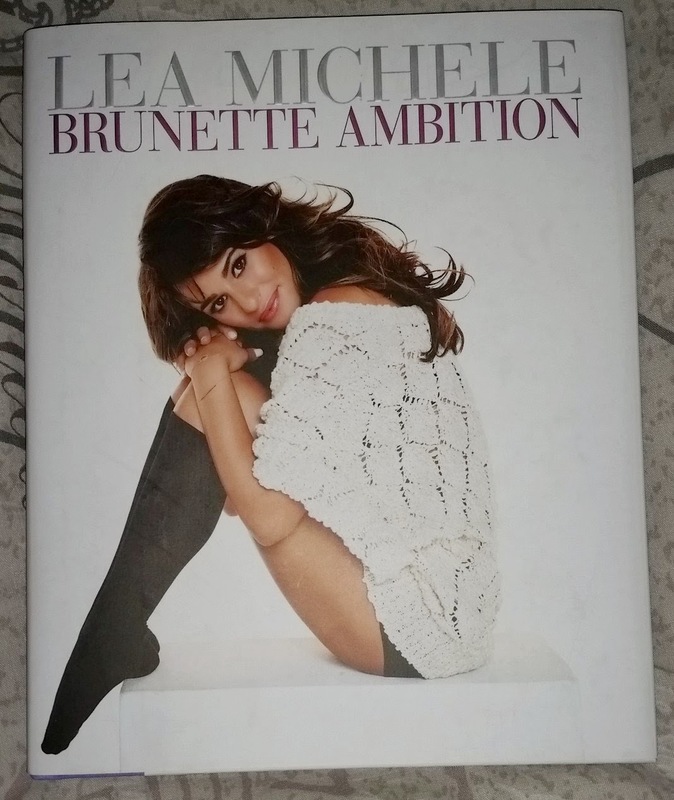 I wouldn't just recommend ‘Brunette Ambition’ to Lea Michele fans (although they will obviously love it!) but to anyone who is looking for tips to become a healthier and fitter person both in body and mind. I love Lea. And I love this book. I really hope that she writes more in the future. This is just a little introductory post to let you all know a bit about who I am and what my blog is going to be about. My name's Rachael, I'm 23 and I live in England. I'm a big reader and book collector. I currently own around 2500 books and I just can't seem to stop myself from buying more! It’s unlikely that I’ll ever be able to read all the books I want to but that’s not going to stop me from filling my head with as many authors' words as possible. My favourite genres are YA, Dystopian, Fantasy, Sci-Fi, Contemporary, Middle-Grade and Graphic Novels / Comic Books. Although I do reads book that fall outside of those categories too. Favourite authors include J. K. Rowling, J. R. R. Tolkien (but I really need to re-read the LOTR trilogy! ), Sir Arthur Conan Doyle, Lewis Carroll, C. S. Lewis, John Green, Suzanne Collins and Rick Riordan. There are plenty more authors that I love but I think those are the stand-outs (or at least one’s I'm thinking of as I'm writing this). I'm always on the look-out for new authors and new books to read. I love collecting my favourite books in different editions. If I see another cover that I adore I just have to buy it! I also really like collecting old antiquarian book as the covers are just beautiful and I love that old book smell. I think the oldest book I own is a non-fiction book about plates and hallmarks which was published in 1886. Not the most interesting subject matter to me but the edition is really pretty and in such good condition for its age. This blog won’t be all about books though. I plan on writing about everything that interests me. I may review some television shows or films. I’ll probably talk about comic books and science fiction quite a bit. And I reckon I'll also be reviewing my subscription boxes, mainly Loot Crate. What can I say, I'm a geek. But primarily this blog will be book reviews and discussions. I'm by no means a professional reviewer so sorry if they're not great to begin with but I'm sure I’ll learn as I go along. If you think this blog may interest you by all means follow and share with your friends. I would love for you to comment telling me a bit about yourself and what your favourite books and authors are. You can also follow me on Twitter, Instagram and Pinterest for updates (links at the side and down below). Thank you for reading and I hope you will join me on my blogging journey! These are very much a work in progress still and will get better with time!